ESI is a solid foundation for future academic achievements. It is learning how to learn, how to solve problems. It is a child learning how to achieve goals, how to overcome challenges, and forming the habit of getting results. ESI is developing the social and language skills needed for successful business and social relationships. It is a well-grounded child, building leadership skills for the future. It is developing perseverance in the face of adversity, and the resilience to handle life’s inevitable set-backs. It is the path to individual integrity and responsible decisions making. ESI is nurturing critical thinking. It is a child who is happy, positive, and motivated. It is founding self-confidence, and the language ability to express thoughts and opinions confidently. It is growing acceptance of the diversity found in a global world. It is learning to communicate effectively. We will teach language skills using the best practices and the best curriculum available. We will provide ample opportunities for students to put their skills into practice, ensuring that students will be able to succeed academically, live a moral life, and utilise their skills in real-life applications. We will ensure, by combining both character development and knowledge and putting them into practice, that students will have a solid foundation from which to achieve a higher level of success in school and beyond. ESI KIDS aims to develop the whole child, by nurturing emotional intelligence, social intelligence, enriching IQ, and providing the opportunities for students to become a lifelong learners. An experiential learning approach is used at ESI, meaning that it addresses the needs of each learner and actively involves them in the learning process through purposeful activities. An experiential learning classroom provides a positive learning climate, makes the purposes of learning clear, and balances the intellectual and emotional components of learning to ensure that the learner develops a full set of 21st Century Competencies for future academic, professional, and social life. ESI KIDS aligns with and complements the refreshed Kindergarten Curriculum Framework recently developed by the MOE. This now emphasises the importance of holistic development of children, the need to build confidence and social skills during the pre-school years, and the need to develop learning dispositions to prepare the children for lifelong learning. 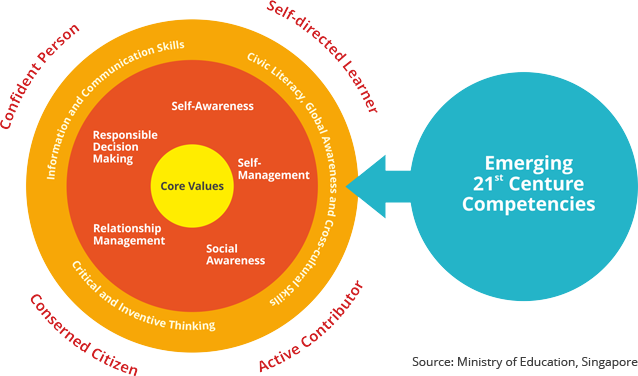 Further, in doing this, ESI KIDS also fulfils the learning gap by building a solid foundation of 21st Century Core Values in social and emotional competencies (respect, responsibility, integrity, care, resilience, and harmony), by using language related to social and emotional themes. In this way, learners build language skills along with social and emotional resilience. ESI Kids uses learning activities as building blocks putting the learner into a situation where one activity leads into the next. For example, in a reading unit, learners may predict the content that accompanies the text before reading it. In a listening activity, language may be recycled from an individual reading, or discovery activity, into a roleplay. Language is revised at the start and end of lessons. Progress and continuity of language learnt and themes are achieved in each lesson. ESI Kids uses a creative, structured approach including play as progress for the younger learner, and games, role play and simulation as progress for the older learner. The purpose of each approach is to ensure that learning occurs through a variety of experiences. 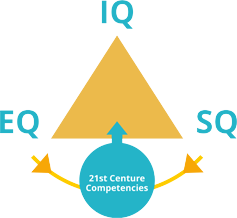 The ESI framework provides a learning environment that helps ensure the learner is able to express themselves positively, has self confidence, and can communicate effectively according to the situation, purpose, and through role-play. Particular emphasis is placed on providing a supportive environment through which each learner’s emotional, social, and academic intelligence is developed. The programme is activity based and is designed to encourage learners to develop a useful range of emotional and social skills. ESI Kids uses an experiential approach in which learners are actively involved in learning. Experiential learning addresses the needs of the learner and involves them directly in the learning process and helps in the development of change and growth. The experiential learning classroom sets a positive climate for learning, clarifies the purposes for learning (“what’s in it for me?”), organises and makes available learning resources, and balances the intellectual and emotional components of learning. ESI Kids gives the learner activities that promote learning and achievement. These activities increase retention, develop social skills, and promote self esteem. Regardless of the age of the learner, positive independence, individual and group accountability, and small group skills are inculcated within the language framework. Until the development of ESI in 2006, children could not communicate effortlessly. The absence of any structured development of language through topics centred around values such as respect, individual responsibility, personal integrating, resilience, caring for others, or life skills of social and self-awareness, relationship building, self-management and responsible decision making was not met. ESI KIDS address this absence by teaching competencies such as ”EQ and SQ” vocabulary, social language skills, and EQ and SQ based copies strategies.